Hidden gems of Seville. Day trip. Hidden gems of Seville. Day trip. Seville is a beautiful city which tends to keep visitors concentrated within the boundary that is comprised of its impressive world heritage monuments. This often leaves people with a rather limited impression of the city’s character and uniqueness. As well as its history, Seville is colorful, it’s joyous, elegant and fun. Sevillanos are proud of their main monuments such as the giant Cathedral but they are even prouder of the many smaller things and customs that make their city so special. They love Seville and try to keep it always looking its best. They like to make it vibrant and friendly too. They often meet their friends (and friends of their friends and so on) in the numerous local bars and they like to participate together very actively in the town’s traditions. With this tour we will walk first through the quarter where the stunning world heritage sites are. Later we will get to the nearby areas of the town centre where Sevillanos actually live and exercise their hectic social life. This will give us the opportunity to take in this local vibrant atmosphere, whilst learning about the history and urban development of the city that became the center of the world after the discovery of the Americas. We will visit a former 17th century hospital that was commissioned by a nobleman who has since been very significant for the locals. Later we will take a wander around a house that represents the palatial architecture of the town’s wealthiest period. We will have a local tapas lunch and then we will walk back through the most picturesque alleyways before saying goodbye to this magical city. 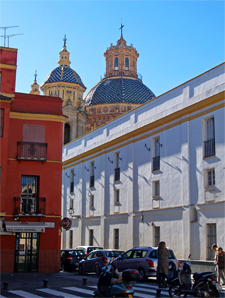 This day trip is ideal for people staying in other locations in Andalusia wishing to spend the day in Seville. It includes private transportation in a modern and comfortable vehicle with A/C to and from your accommodation. Your personal guide and driver will pick you up in the morning and will drive you back in the late afternoon after spending a great day together discovering the hidden gems of Seville. Prices: start at 89 Euros per person (incl. VAT) for a group of 8 people.